One of the finest stories produced and without question the best of the series finales from any generation, All Good Things... is often cited as bringing us full circle, rounding off the series by returning to the beginning as well as showing how the characters might evolve in a possible future. But what does this episode tell us about the journey that we started back in Encounter at Farpoint? What ultimately do we realise about this show? The one thing that usually sticks in your mind is that final scene; Picard joins the senior staff poker game after seven years. It's the family feeling in a sense. For so long these characters have lived and occasionally died on our screens together. We have watched them develop and grow not only as single people but as a group, a crew - a family that watches out for each other. Picard realises there what he has missed and how these people have been an intricate part of his life for such a long time. You suspect this was the same for the actors when they filmed this which was, also, the final scene shot of the show. Indeed, the Picard story that pervades the whole 88 minutes of the feature length conclusion strongly emphasises this in whatever time line you choose. In the present his orders and situation are unchallenged. There is no doubt that what he is describing is happening and the crew are behind his resulting actions 100%. No-one questions that they are in danger, especially when Q is revealed to be involved at the halfway point. In the past timeline, these focal relationships have yet to be forged and we can see the hesitancy, the uncertainty of what is being asked by their captain from the second he steps off the shuttlecraft and launches the Enterprise into a red alert due to his visions. Here his explanation, which he cannot give, is necessary to settle their doubts when going against Starfleet orders or calling out for Q to reveal himself for the first time. The final speech that Picard gives as they are about to take the new flagship into the anomaly is one of the best of the series. It is the realisation of the whole series as he knows what they can and will become as the mission continues. In fact the key to the enjoyment of the scenes in the past is very much around the "insight" we have into these characters futures and their development especially the more simplistic Data. The future is a reflection on the relationships of 25 years past. They have developed but not in the best of ways in all cases. 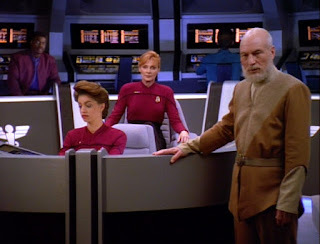 It shows that these familiar characters are indeed flawed in ways that we may never have imagined, particularly where Worf and Riker are concerned following Troi's off-screen death. While this was a recent addition to the series (only rising from the page in Parallels) it plays a major part here especially in the future storyline. Also the cute touch with Data worth noting is his throwaway line that his housekeeper makes him laugh. Emotions have finally become a piece of his personality as are contractions. In regards to Picard however their belief in him is perhaps more motivated by sympathy than anything else. They follow his requests but do it to humour initially rather than because it is of vital importance and crucial to the existence of humanity. The future is almost a Scrooge-like vision where nothing has worked out for the best and several of the crew have taken knocks through their lives. What remains throughout is that dedication to a solution. No matter the experience of the crews from the three timelines, they all seek a solution and without fully being aware, work together to collapse the anomaly. While the future isn't as dark as one of the lighter moments of Deep Space Nine, it's not the perfect, conflict-free world that Roddenberry envisaged. The Klingons have conquered the Romulans, not everyone gets on, the Picard's have divorced, Jean-Luc has a serious mental illness; it all seems like it's been for nothing and the utopia is not everlasting - and add a third nacelle onto that for good measure. Yes, it's all done for "fun" because this is a timeline that won't occur (also see Star Trek: Generations) and that's made perfectly clear in the final scene. The family that was created back in Encounter at Farpoint is ultimately more than one time period could handle and one that will endure for a long time to come no matter where they end up in the big scheme of things. Their link back to this period on the Enterprise is key to who these people are, were and will become. Perhaps in a way the finale is reminding us that while The Next Generation would cease to make any new TV episodes it too, like its characters would continue whether it would be in reruns, comics, novels or the four movies that would follow. It is a legacy that has prospered more inspite of Insurrection and Nemesis rather than because of them. Ironic that the more popular series of the two that became movies was not as successful on the big screen as The Original Series. But while this is the key to the whole, what else do we see in All Good Things... that ensure its a fitting conclusion? What brings the show back to its origins and also shows how far it's come? Onscreen the acting has come on in leaps and bounds. Time has been kind to Troi for one. In Encounter at Farpoint, Sirtis was almost unwatchable and over time she certainly got a lot better as the writers understood the character and established stricter guidelines especially around those Betazoid telepathic abilities. Sadly on the rewatch though I felt my original and younger eyes were probably a little over-kind as Sirtis only occasionally shone and often took a secluded background role. At least All Good Things... made us realise that her attire had been seriously upgraded over the seven seasons from the skant uniform that is pulled from the wardrobe here. Lucky for Troi they didn't choose to put this past installment within the first season or there would have been a serious clothing disaster. The acting advances are certainly the most notable with everyone a lot more relaxed after growing within these roles. Picard is a lot less shouty and maybe a trick was missed in the past scenes to let him revert to that characterisation. Makeup-wise though I'm glad we get to see how the pilot might have looked with seven years more experience. Worf for one is a serious difference. While the gold sash returns we don't get his original Klingon look. The beard is a little less full, the hair trimmed, the moustache a little shorter and the skin tone lighter. The forehead is distinctly refined and the character much more than a growling background crewman that he was at the beginning. Hard to comprehend that eventually Worf would rack up more hours on Star Trek than anyone else. Second place on that list goes to Chief O'Brien who also appeared in Encounter at Farpoint but listed as "Conn" rather than the character we would come to know over time and Deep Space Nine. Now the character of Q is central to the episode but it depends which version you watch as to how you view his return for the finale. 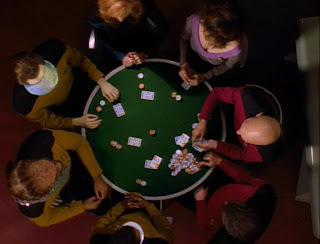 If you watch the two part edition (which was the first one released in the UK), then you get the feeling that Q is meddling in the timestream and playing Picard along at some sort of game to find out what is happening but in the feature length version it becomes clearer that the omnipotent being is actually helping the Enterprise captain to work out the puzzle without letting the Continuum know. It's impressive that a series of such small cuts to the final version could change the perception of one character so dramatically. Q in that two part snip is much closer to the meddling, arrogant individual that we saw back in Encounter at Farpoint with his more playful elements swept aside. Yet he still has some love for humanity as shown through his assistance in Picard's temporal shifting to realise the paradox. 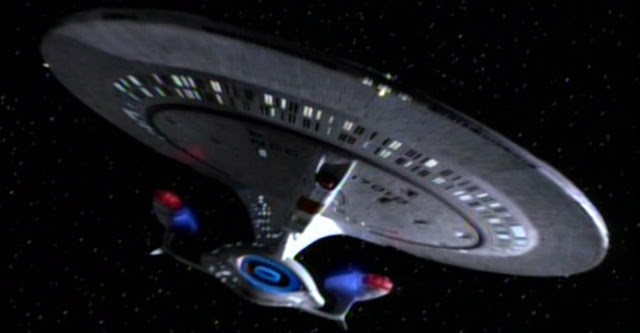 This only really shines in the full version which restores not only the correct portrayal of Q but also some clips which just help flesh out the story - Geordi is married to Leah (Brahms) and has three kids; Picard chastises Worf about honour to get passage into Klingon space and in the past Troi reveals that she and Riker had a past relationship. The editing of the show makes such a difference to the story and our viewpoint of Q. Indeed the full version rounds off the character nicely while the cut version just makes it look like he's been reset to 1987. While All Good Things... tracks back to the trial that kicked off the series it also shows that Q has become a splintered limb of The Next Generation family and wants them to succeed and not be erased from history even though the Continuum have decided otherwise. His transfer across to Voyager seemed to have worked a treat in Death Wish but after that the stories didn't do De Launcie credit. Over the course of the series Q has helped, hindered and played with the crew but always with their "best interests" at heart. While it is Picard who is moving through the three time periods Q is ultimately the one who controls whether they win or lose. In reality is it Q deciding the fate of humanity rather than Picard? There's only so much however that you can show has developed and really you would have to sit and analyse the pilot and the finale beside each other. Yes, the acting is a light year better in all respects, Riker is a little greyer and more beardy; Data less wooden and Troi a lot less emotional, but there's more as well. Notably Picard doesn't insist on communicating to all decks via print out as he does in Encounter at Farpoint when being chased by the Q barrier. Respectfully some of the set changes that have occurred over the years are reflected as well although because (I believe) the chair went walkies, we don't get to see Picard's flip-arm captain's seat back in action. The observation lounge does get it's wall of Enterprise's back for a guest appearance as are the original style bridge wall panels back in place for the past timeline. In its way, the finale is both a warm hug of nostalgia just as much as it is a grandiose finale to wrap up Star Trek's successful sequel series. Now I'm not super-picky but there are a couple of things that do bug me about All Good Things... timelines - Data's rank pips for one are incorrect in the past and how come there are three inverse tachyon pulses apparently emanating from the Enterprise's when one of them was fired by the Pasteur? Why can't they see the anomaly when they arrive in the future if it's travelling back through time? It would just be really really small - or would it paradoxically not appear still or...Brannon Braga has a lot to answer for..as does whoever chose the cuts to get it into two parts. Nevertheless it's a top slice of The Next Generation from start to finish and it not only covers the theme of family, the passage of time but also that things aren't constant. Times change, things won't be the same for both the cast and the audience watching. This stage of the voyage is complete. So this also marks the last small screen meeting I'll be having with this crew for some time and it's crammed with great moments that turn a great finale into a classic. While the Enterprise conversion is questionable, it's good to see it's arrival and not on a "2D" plane as you would expect - space is after all three dimensional (see also Star Trek II: The Wrath of Khan). 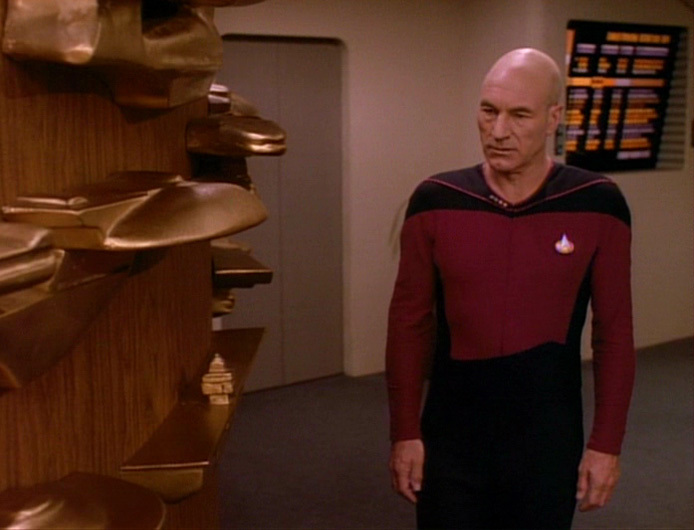 Picard ordering Earl grey on the replicator only to find that it's not programmed is also a great nod to one of the series' "trademarks" and character nuances - and if we're listing nods of the hat, how about the design of the Pasteur as a homage to the original design plans for the NCC-1701. 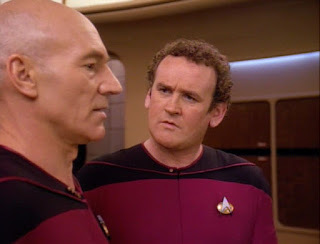 Colm Meaney's return is a nice turn too and ensures that the character he played back in Encounter at Farpoint was O'Brien after all and not just an unnamed officer as he was back then. Anyway, while we get to comprehend how much these guys have been part of our lives for so long we realise how far they've come from that first season, from Patrick Stewart living out of a suitcase for six months, from Tasha getting splatted by Armus or how synthezised the music was back in the late 80's against the orchestral maneuvers of the later episodes. All Good Things... is a celebration of their achievements because there was no way they would make it to 80 episodes, or 100 - ever. It was doomed to fail because it couldn't be like the original and for that precise reason it probably succeeded. The background, morals and beliefs that dripped through every pore of The Original Series was there but updated and appropriate for the decade. 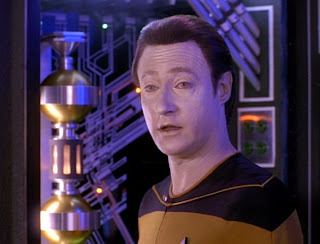 The Next Generation allowed Star Trek to grow and by providing it with the opportunity to sign off in style (unless you were robbed with the two part version) as they deserved. It would be an achievement that none of the series to date would manage. No other show has hit 178 episodes (Deep Space Nine came close) or has such love from the whole of the Star Trek fanbase.